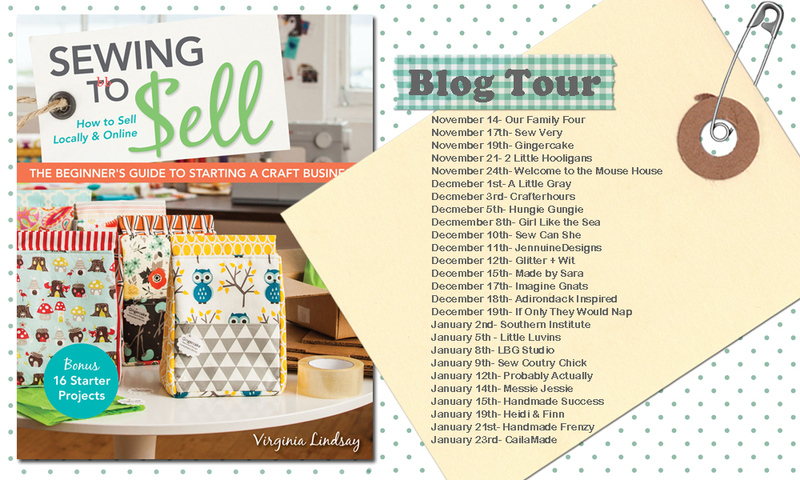 When Erin and I were invited to join the book tour for Virginia Lindsay’s Sewing to Sell, we were totally pumped. Virginia has been selling her adorable handmade goods and patterns long enough to have learned a thing or two about the process. You should check out her blog, Gingercake if you haven’t! In her newly released book, she gathers what she has learned from experiences and hands it to you. Here ya go future-Etsy-store-owner, or wanna-be-craftshow-vendor, its all right here! In Sewing to Sell, you will learn about knowing your market, maximizing your time, pricing your product, and packaging, so that your hardwork and love (because there is always love in handmades) can actually PAY off. Oh and there’s one more thing, actually 16 more things- this book includes 16 PATTERNS (copyright free- to help you get your shop ready)! Lunch bags, pot holders, tablet covers, and so much more. I mean, even if you are not ready to put your goods out there for sale, this book is still worth the purchase! Check out what I made!!!!!!!!! Can you tell I’m excited? 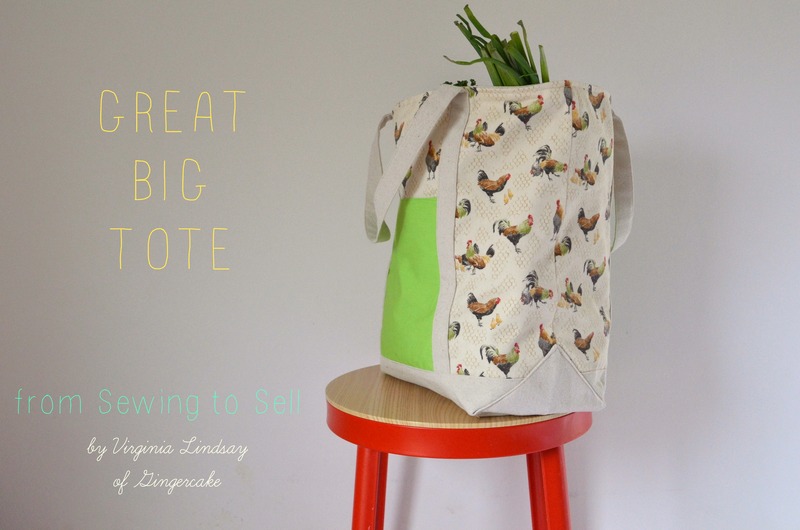 When I looked through the patterns in my eBook copy of Sewing to Sell, I kept coming back to the Great Big Tote. 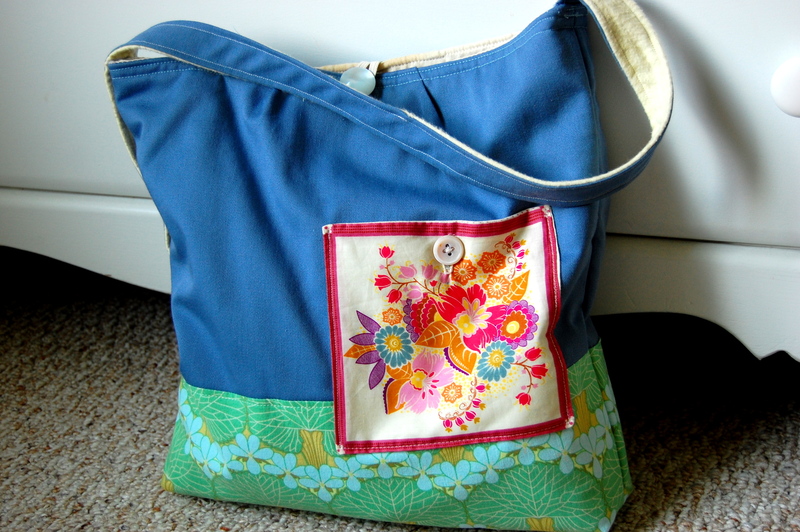 Can you believe I have never sewn a bag of any type? I have no idea why. 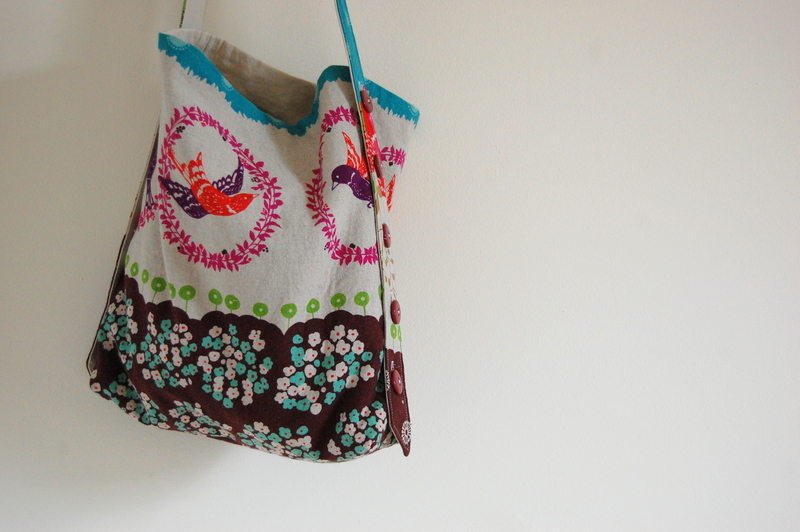 I love making useful items, and also showing off my handmade work, so it was high time that MAMA GOT A BRAND NEW BAG. Make that two brand new bags! 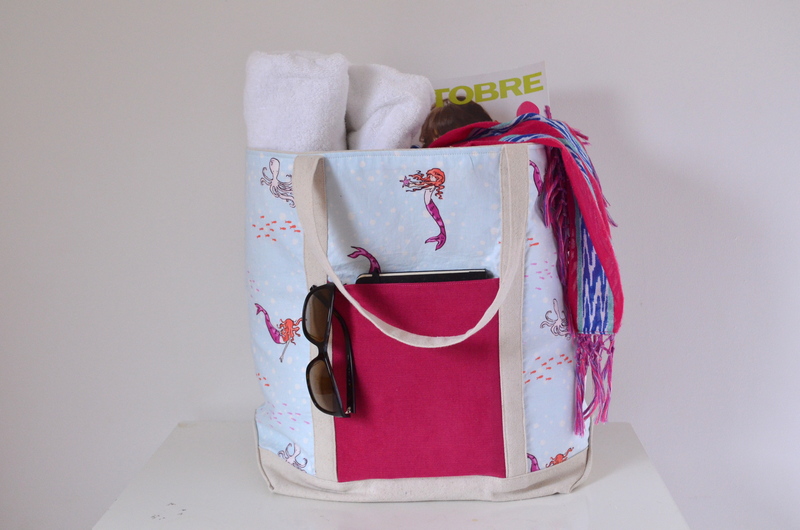 One for the market, and one for the beach! 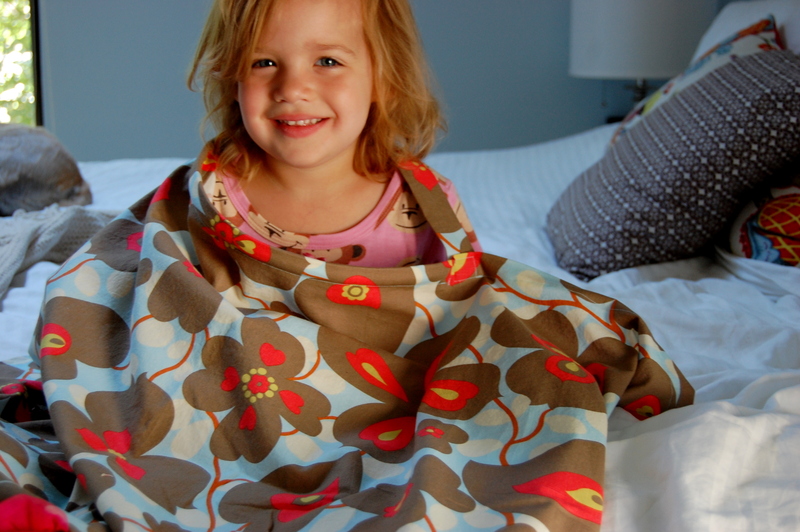 I took Virginia’s advice about taking an assembly-line approach when sewing multiple products. The repetition of each step helped me to keep my head in the game and to sew more conscientiously. There was zero seam ripping, and zero curse-words with this approach! I truly enjoyed the bag making process, and watching it literally unfold (through a four inch hole that you will later topstich close ;)) was fascinating! 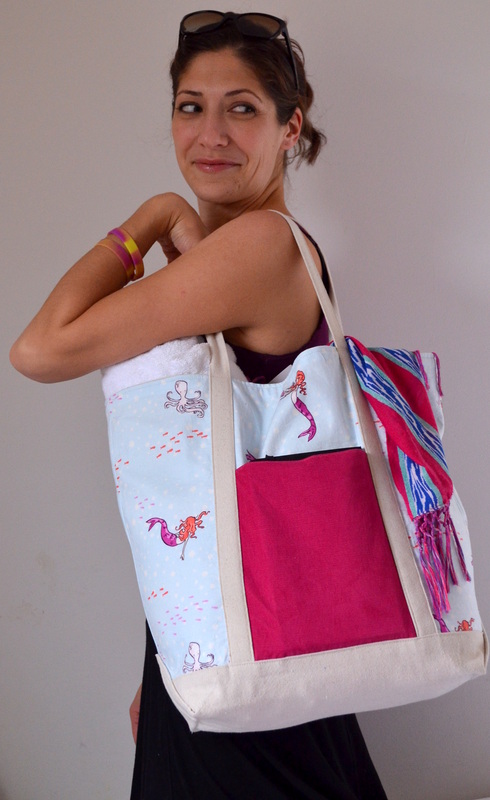 Bag making is so cool! I’m hooked! Here I am pretending that I just plucked a bunch of green onion out of my winter garden. Tee hee. Erin was helping me with the photo shoot. She had to put her foot down when I told her to take my picture while I pull a carrot out and feed it to her neighbor’s horse. What? Too contrived? Fine. 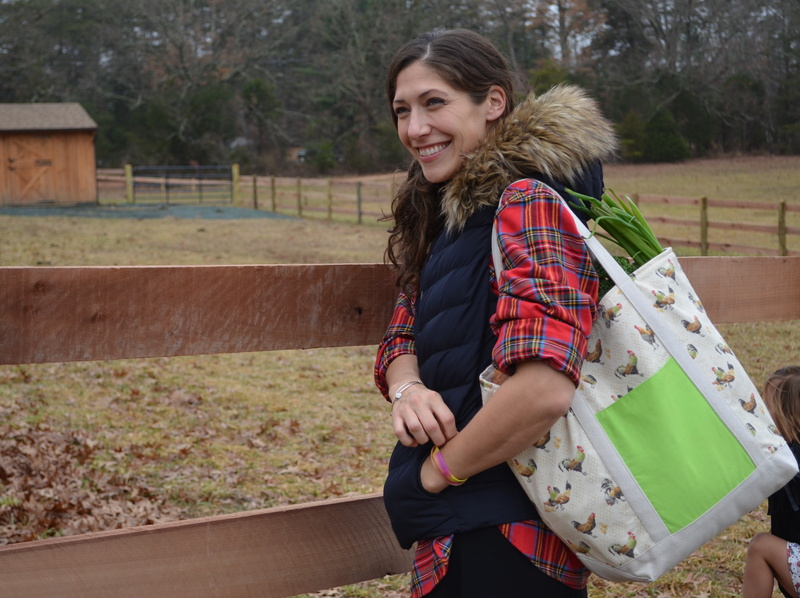 We sure had fun styling the bags for the shoot. I am shocked how much stuff can fit into these things! The mommy-market would be all over this tote. 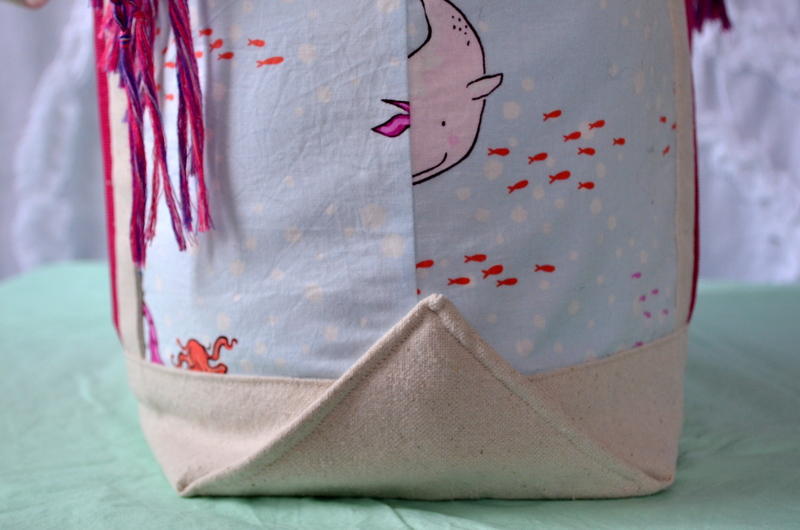 Virginia suggested using painter’s drop cloth canvas for a sturdy bottom and lining (It’s super economical). I still had a bunch left over from when I made 3 bedskirts out of this stuff, so that worked out! It actually sews really nicely through the machine. The coordinating fabric was handed down to me by a friend who is just an occasional sewer (Mermaid Play by Michael Miller). 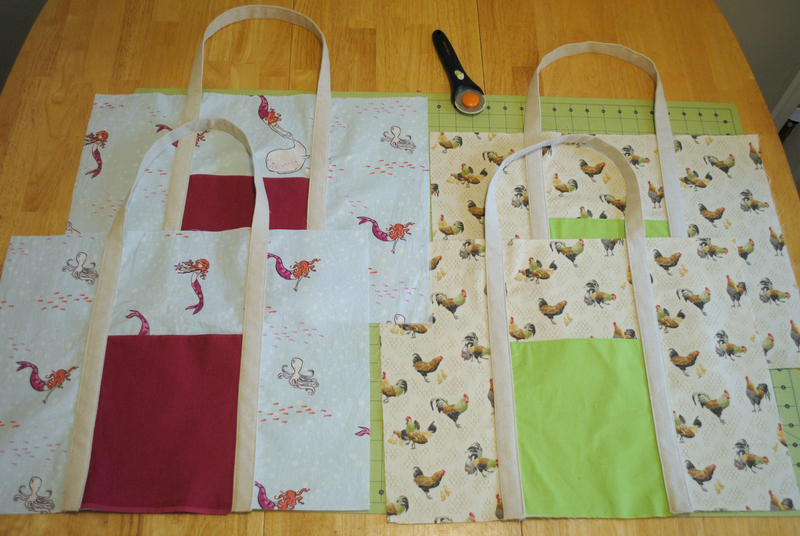 The chicken fabric was purchased for a different project, and the pockets were scrap. 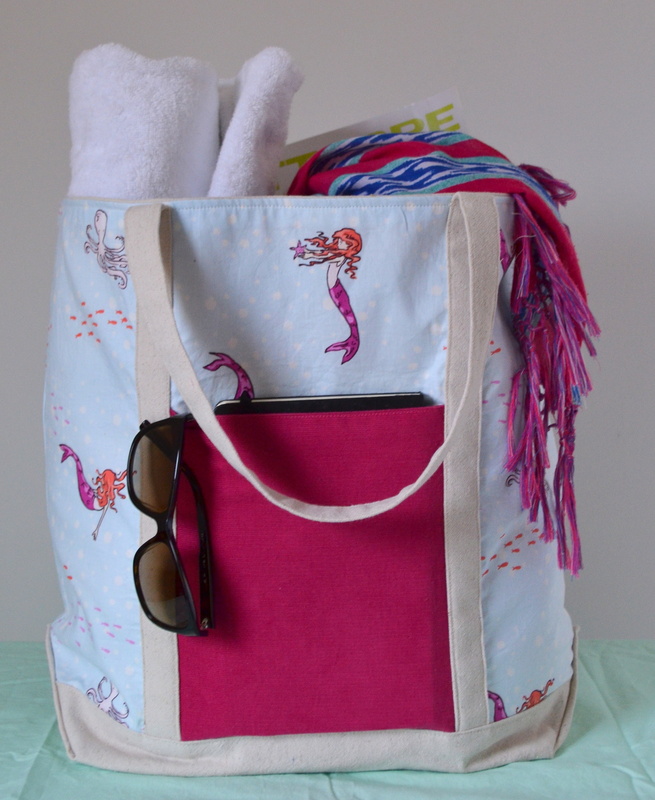 So, both bags, cost me nothing to make! Okay, wait, I bought some interfacing for a few dollars. It’s a little hard for me to clock my hours when they are all just stolen moments in the midst of parenting, but I’d guess roughly 6 hours was put in to make both. I am a very slow sewer. 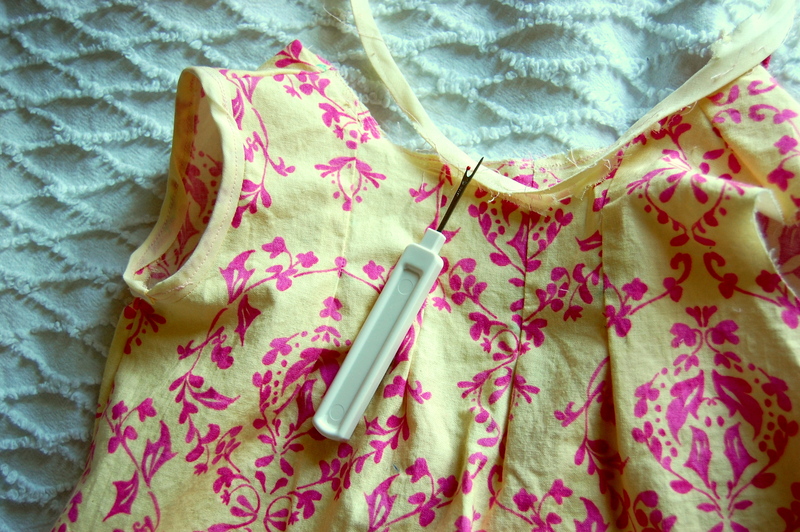 Sewing to Sell offers advice on pricing your items so that your hourly wage doesn’t become peanuts. Or in my case, Skinny Pop. I’m so addicted, they’re gonna have to change the name to Chubby Pop. 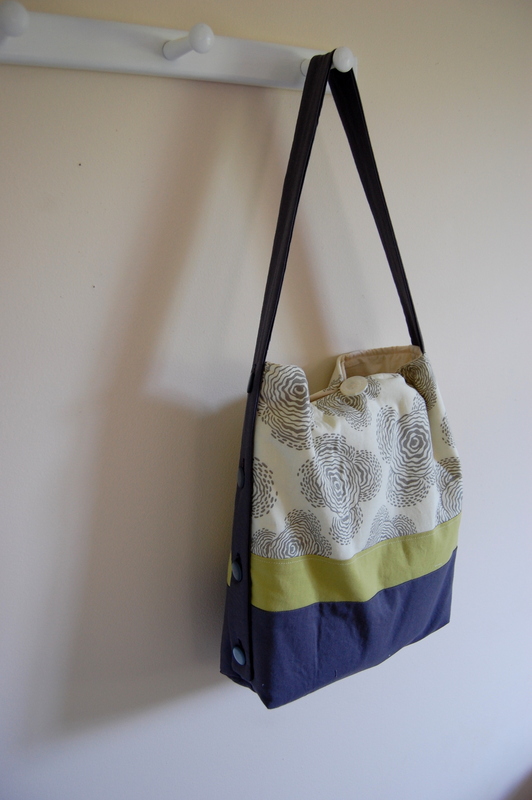 I still can’t get over the fact that I made a really nice, durable tote bag! The pattern instructions were clear and uncomplicated. The only tough part for me was at the very end, sewing up those corners. There was a good bit of fabric to get through at that point. But hey, we are humans, not machines. I’m pretty sure I’ll still be turning heads at the kiddie pool next summer! Heads of moms…who want my bag. Virginia is graciously offering a free hardcopy of Sewing to Sell to one of our readers (within the continental U.S.). Just leave a comment below! The giveaway will close Sunday 12/7. And if you don’t win, follow the blog tour for more opportunities! Thank you for entering! A winner has been chosen at random, congratulations lisacrafty! 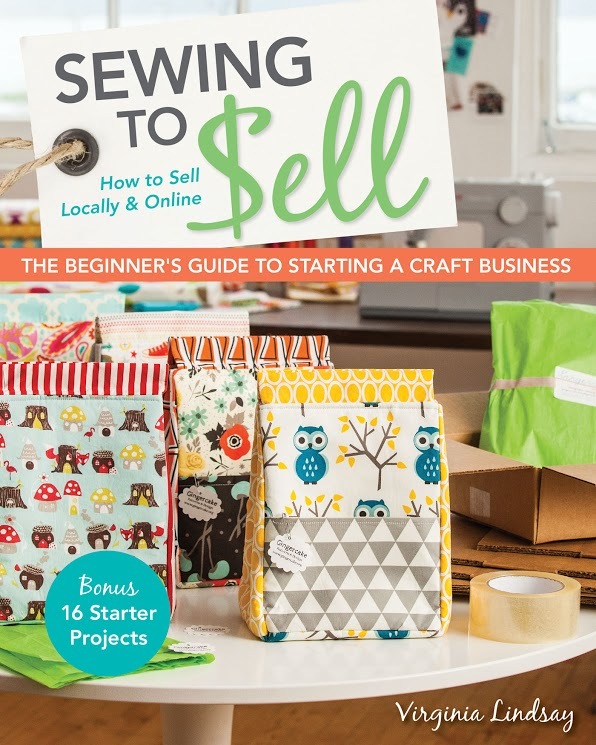 Enjoy your copy of Sewing to Sell! Actually, she’s my only customer. Her name is Amanda and I met her in ’03 when we worked together at a Belgian patisserie in the little town of Kent, CT. When we weren’t enrobing chocolates (looking like Lucy and Ethel I must add), we were listening to Iron & Wine, baking eating Madelienes, imitating our interesting bosses, and making each other laugh hysterically. Since I moved to Virginia, we only see each other maybe once a year- but we talk on a very regular basis. Oh, and she was the recipient of my first Awesome Bag. Lately, those talks have been about fabric- since Amanda has “ordered” some things. 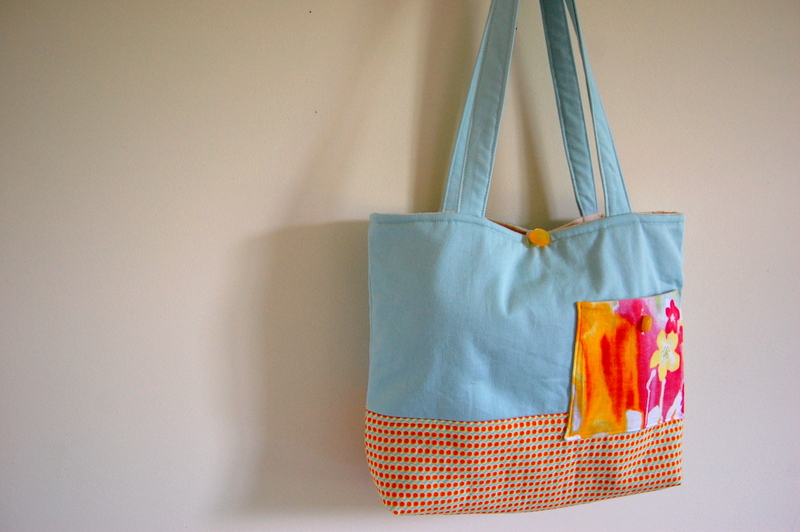 This bag is a birthday gift for a friend of hers…Naturally, she gets a friendly discount. The solids are Kona cotton in charcoal and artichoke. The print is Amy Butler. The strap is adjustable on one side… the vintage buttons were part of the yard sale score from a month ago. Amanda also requested a nursing cover for her friend who is also expecting a baby soon. Again, I used Prudent Baby’s tutorial for this. It’s so quick to make. I hope Amanda and her friend like these goods! 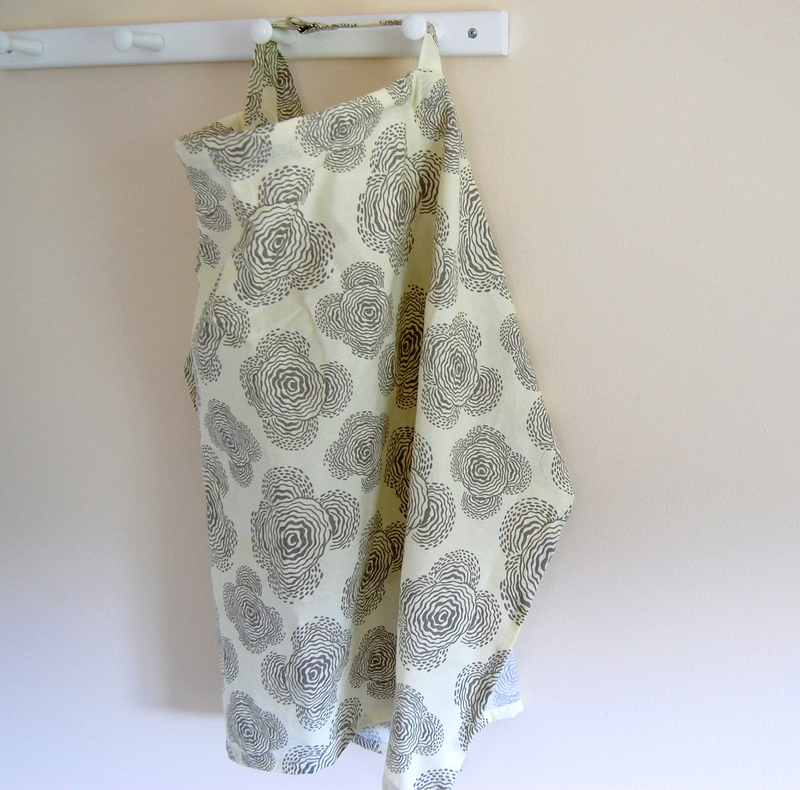 Just goes to show, you can find lots of usable fabric in your own closet! This is our favorite way to beat the heat. 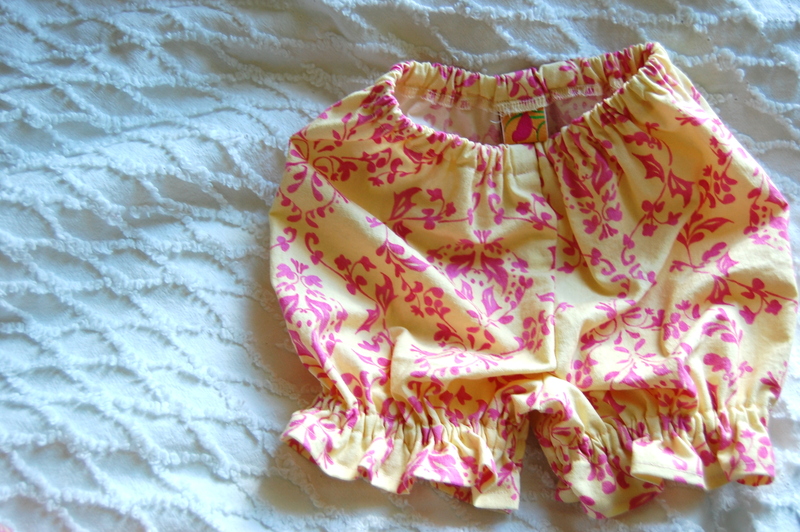 Floral bloomers to go with a top, made for a good friend’s new niece. 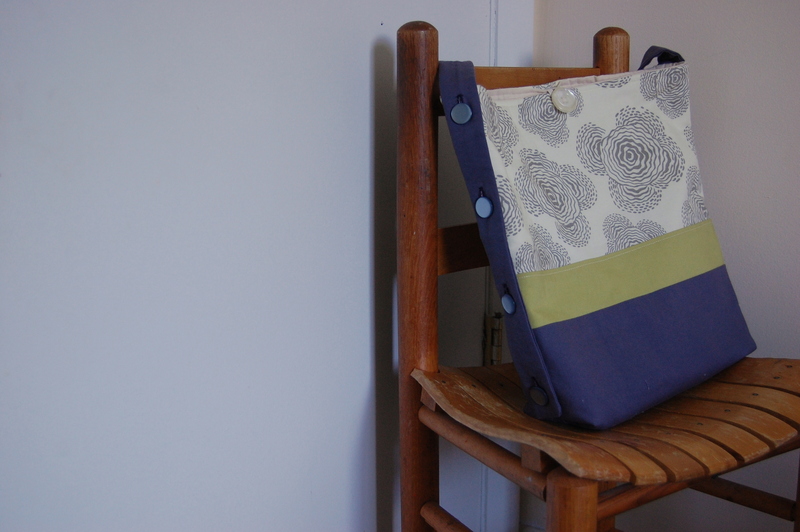 A spring tote, waiting for a good home (preferably before Summer). 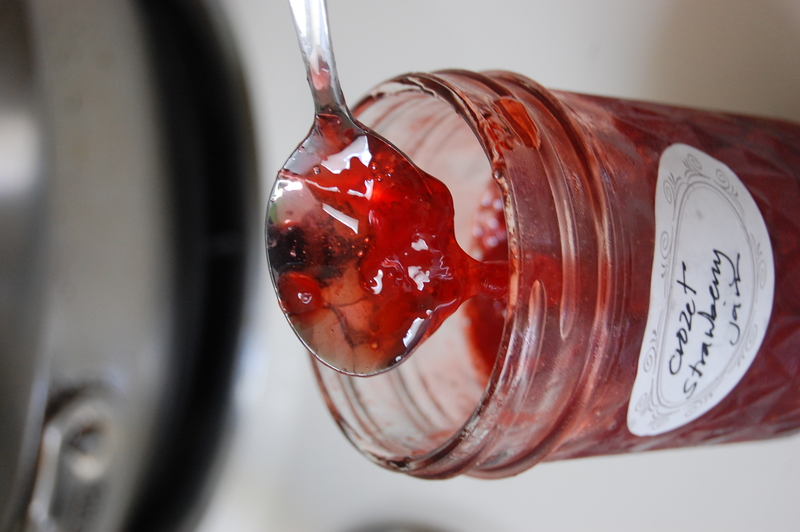 Jam made with strawberries picked by the fam. My 3 year old modeling the cover… You should know that she has proudly nursed all of her baby dolls (and stuffed animals, and dollhouse people). 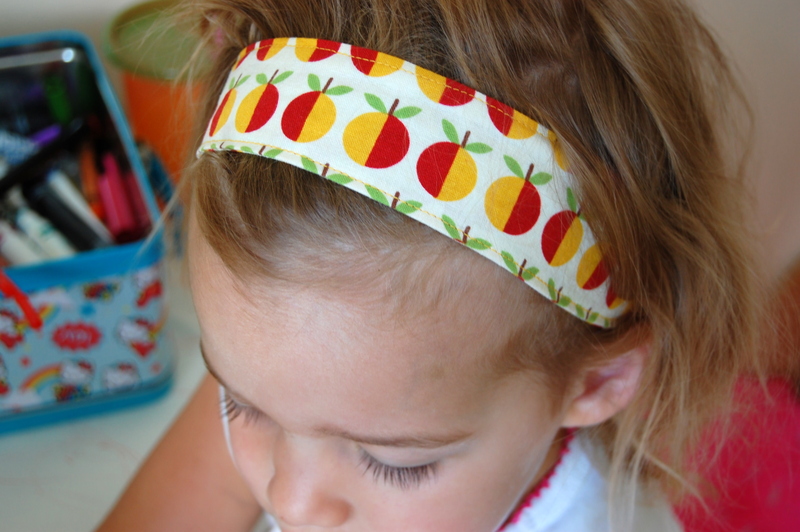 A simple headband for a birthday girl friend. 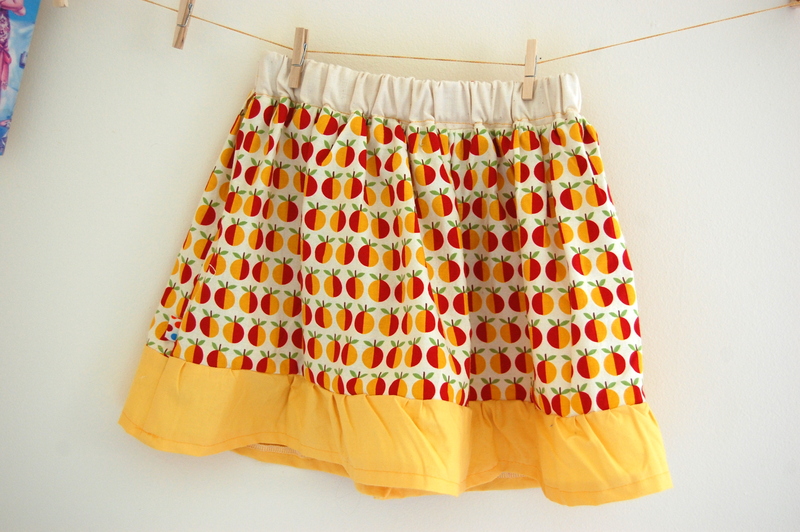 To go along with this market skirt. 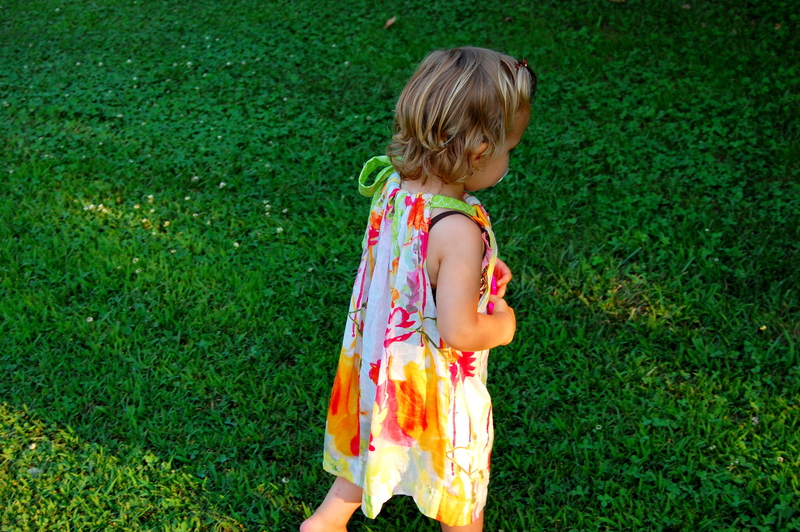 Ellery’s new favorite dress, made not by me, but by my uber-talented mother, Kate. Another “Awesome Bag” with a few modifications- an interior pocket, aqua twill for the back, and a vintage button closure at the top. Again, using some Echino fabric. 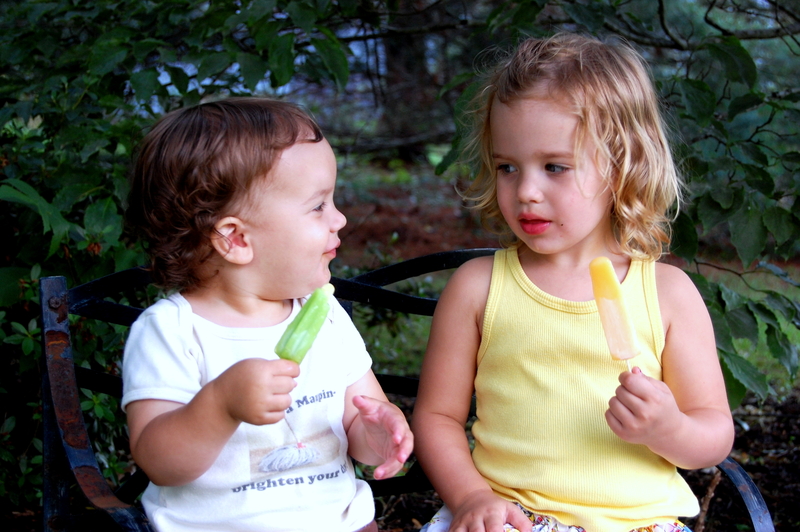 Hope you’re all finding fun ways to beat the heat as well! I’m off to the pool for a special date with my girl. 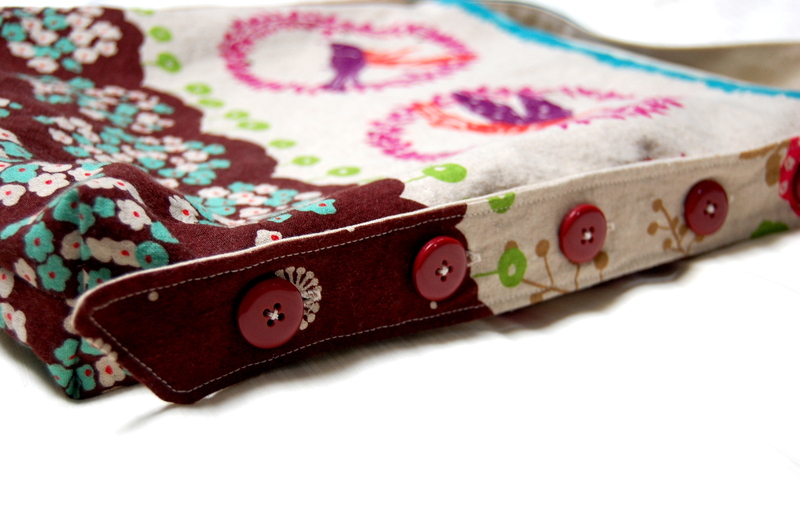 I liked the adjustable strap idea from the Awesome Bag, but I didn’t want to get button-crazy with this one…. 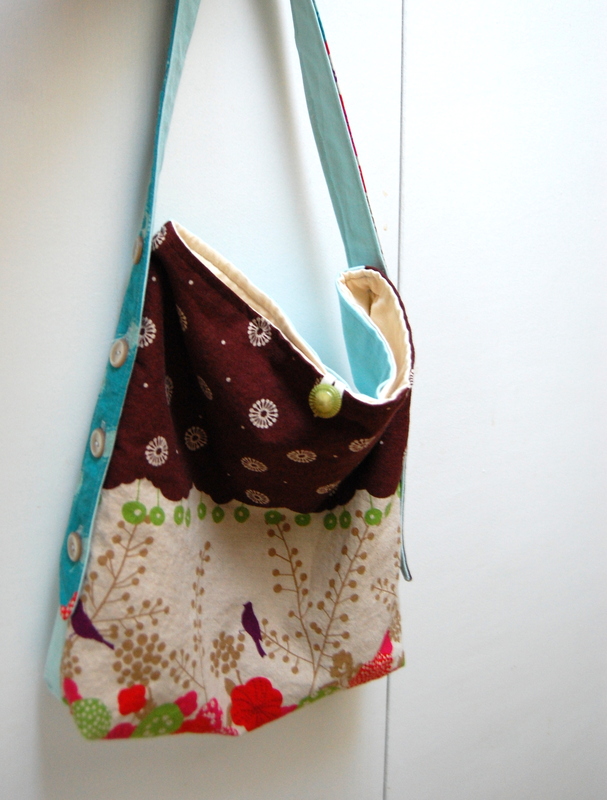 SO, I sewed one side of the strap to the bag, and made three buttonholes on the other side of the strap. I recycled some sweet buttons from a sweater (which sadly, I only got a few wears out of before it started unravelling into oblivion! …I’m so annoyed with you, J.Crew!). The flower fabric is Anna Maria Horner’s square dance voile. It makes a perfect pocket. The green print is Amy Butler, and the solid blue is cotton twill. Instead of interfacing to give the bag some structure and heft, I used some old fleece I had lying around- the bag has a nice weight to it without feeling stiff. The main lining is made of muslin. I’m kicking myself that I didn’t put a pocket on the inside too to hold all my small junk like lip gloss, keys, loose change, and loose crumbs… oh well, next time. 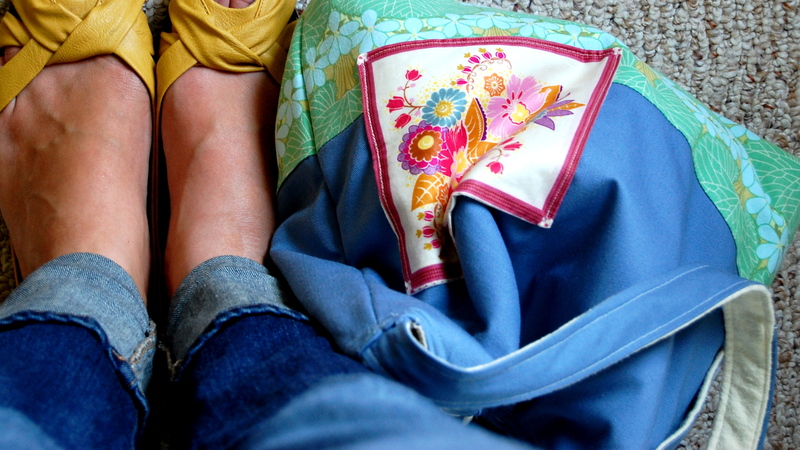 For now though, I love that this bag is pretty, bright, and soft. I especially love that it looks so nice with my new (and more importantly cheap) yellow Target shoes. 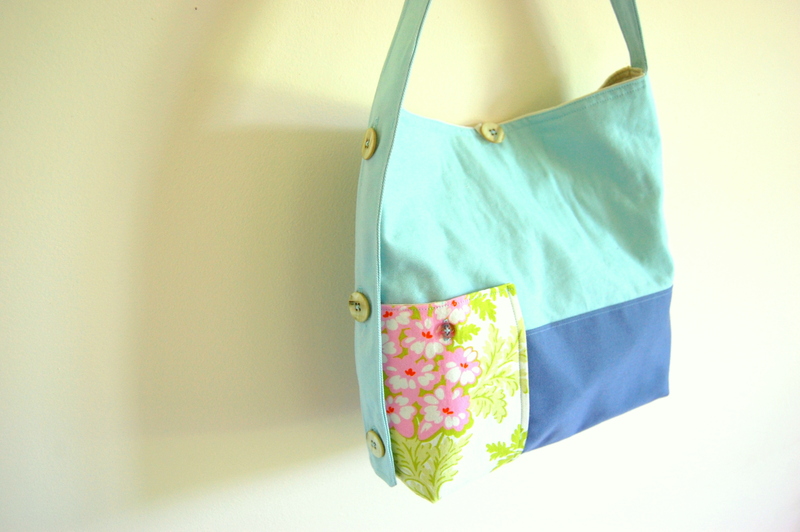 I made this bag using a super easy tutorial by Meg of Elsie Marley. 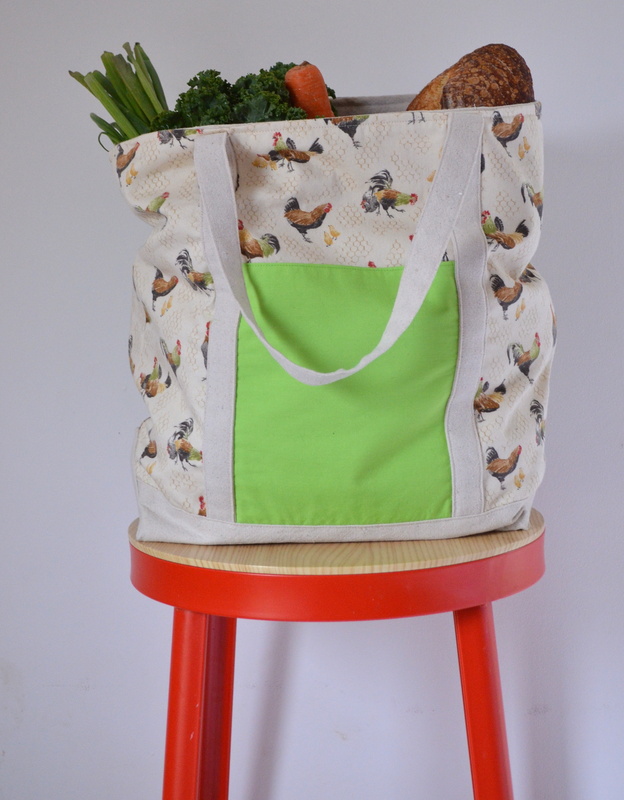 It’s called “the awesome bag”, and for good reason. 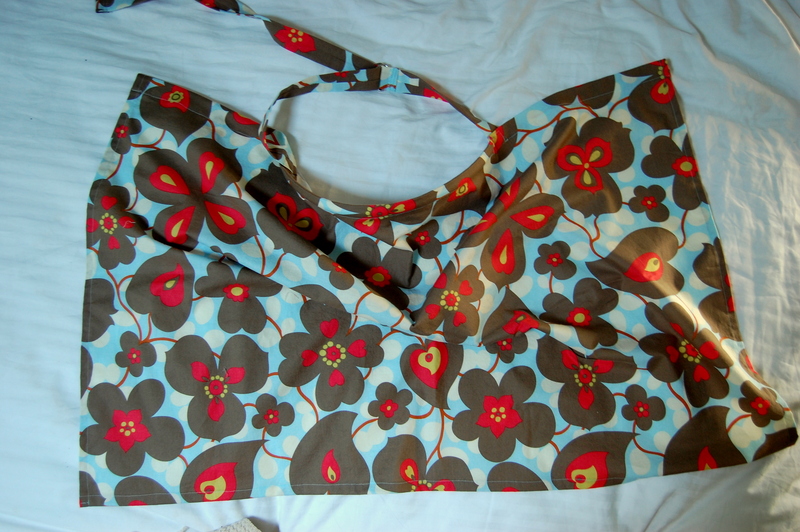 It’s reversible, and the strap is adjustable… It uses 2 different fabrics- using only a 1/2 yard of each, which is…. dare i say it- awesome. 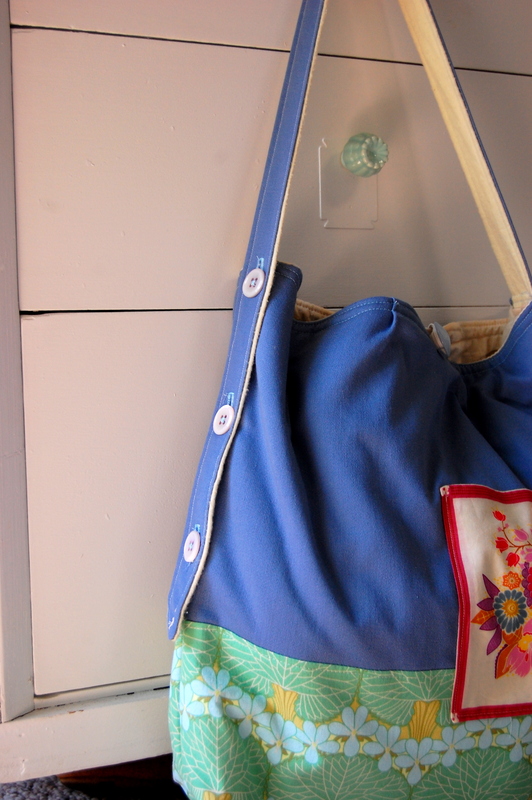 There are 5 buttons going up each side of the bag, so you can adjust the strap length to your liking. 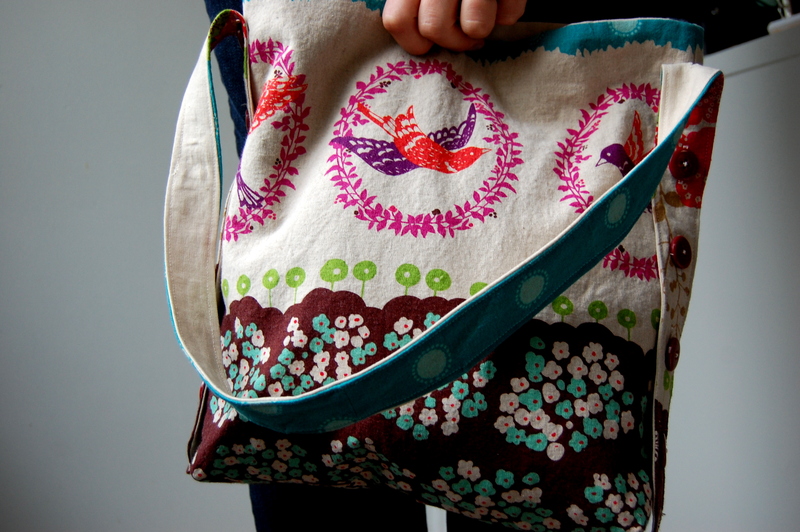 Make it long, and it’s like a messenger bag- or keep it short, and it’s more like a handbag. 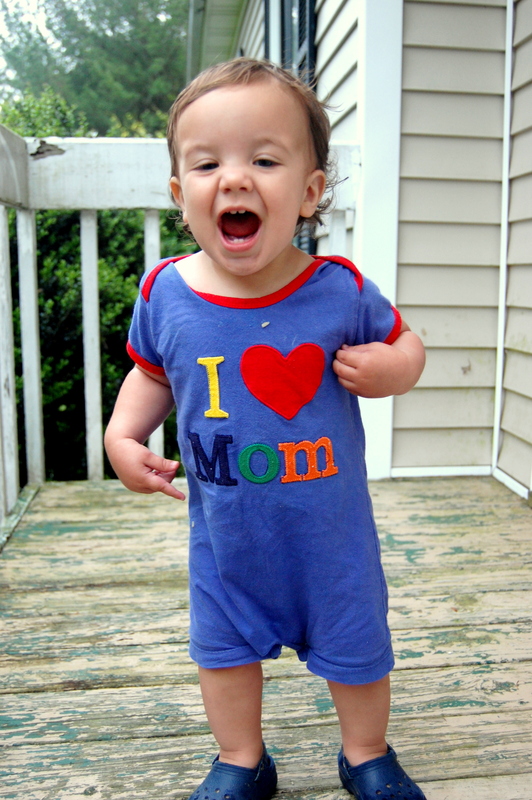 It is completely reversible- the strap as well…. (that means there are… 20 buttons in all- 10 on the outside, 10 on the inside. yowza.) So, you can change it up based on your outfit or your mood. The inside fabric on mine is a khaki linen, and the outside is some Japanese fabric that I’ve been wondering what to do with for a long time…. it’s by Echino. I think this was the perfect project for it. I’m not sure if I’ll keep this one for myself, or give it away… I have it in mind for a friend who happens to be…. you guessed it- awesome.